For my ambassador role with Breast Cancer Care WA ‘s IGA Purple Bra Day I thought I would throw a big morning tea for a few of my girlfriends! This was actually outside of the scope of the ambassador project. They really just wanted me to talk about Purple Bra Day and encourage people to hold an event, I didn’t have to raise any funds or hold my own event. But where’s the fun in that? Nothing like a bit of walking the talk, right? Plus you all know how I love to cook and bake! 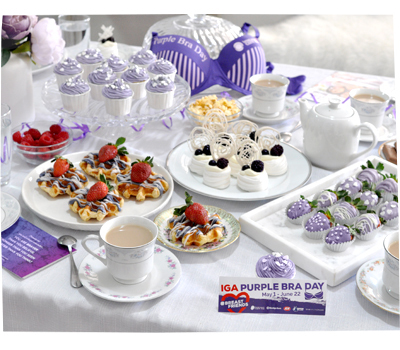 IGA Purple Bra Day is a fundraising event from 1 May – 23 June and anyone can join in the fun! 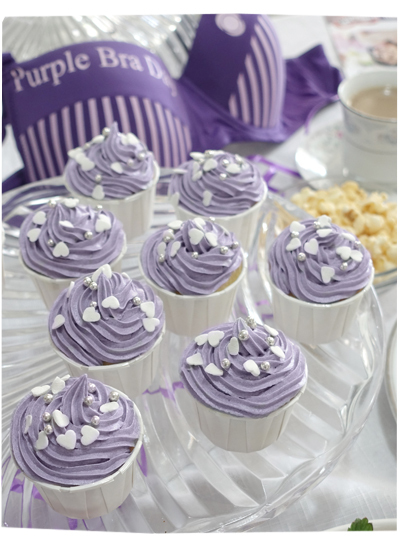 You can head over to www.PurpleBraDay.com.au to register an event, or make a one-off donation. Then you simply hold your own event… have a morning tea, a bake sale, a sausage sizzle, organise a dress up day at work, dye your hair purple (or shave it off! ), set up a collection jar at your workplace, have a girls night in, or go big and challenge yourself in some way (jump out of a plane?) all in the name of fundraising for a worthy cause. I’d love some support, any donation will help, big or small! Thank you! I actually had ham and cheese croissants in the oven, which I forgot to lay out for the photo. And a platter of fruit. Where would I have put everything? Who knows? 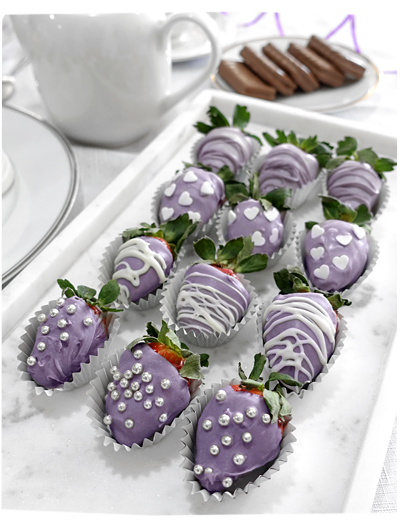 It was my first time covering strawberries with chocolate. I had to throw out my first 3 failed attempts (actually I just ate them), but it got easier after a bit of practice. Tip: They look 300 times better once you place them in a mini cupcake case! Tip: Spend a bit more to use really good chocolate and they’ll taste amazing. Tip: Use a bit of coconut oil to keep the chocolate runny and easy to work with. 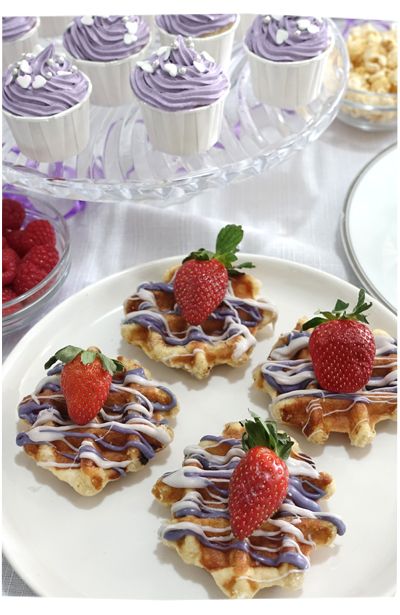 I put together some waffle bites – which were a hit! I didn’t make the waffles, even though I have an awesome waffle recipe and an awesome deep-pan waffle maker. I bought pre-made waffles from Coles and they tasted surprisingly good, like doughnuts. I made these from scratch! I made them the night before and iced them in the morning. They were white chocolate cupcakes with purple butter cream icing. They tasted lovely, moist, but boring. Next time I’ll stir through some passionfruit pulp or something. 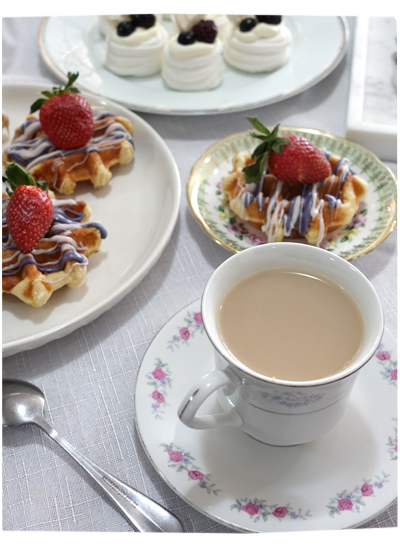 I used all my cute, op-shop found, vintage tea cups and saucers – yay! This is pretty much the main reason I like to throw girly morning teas: I get to use my eclectic vintage tea sets haha. 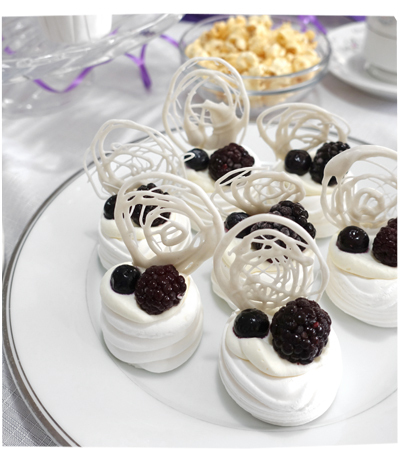 I also bought these meringue cups, added whip cream and berries. I had heaps of melted chocolate left over, so I made the little swirl things on top at the last minute. (I think these were too sweet, not many people ate them and there were a lot left over). Anyway, most importantly we had a fab time catching up. A big, BIG thank you to my girlfriends who donated, we managed to raise $200!